In recent years, people in many parts of the world are working to create new types of cities and communities. 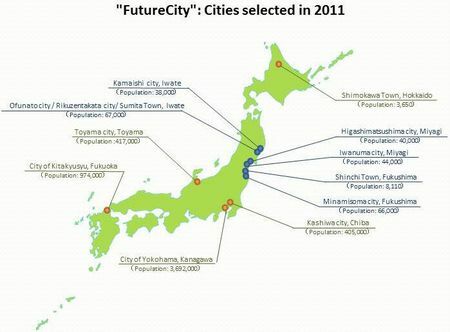 The Japanese government is also developing an environment-friendly "FutureCity" Initiative (FCI). The FCI was launched in 2011 and is now in its seventh year. It is being promoted by the national government's Cabinet Office, and 11 cities have been authorized as "FutureCities" as of March 2014. This webpage introduces the FCI, both the FCI concept and its progress so far, based on information from the Cabinet Office. Urban populations have increased sharply and now comprise half of the world's population. The United Nations projects that they will grow to about 6.4 billion in 2050, comprising about 70% of the world's population. This rapid urbanization is seen prominently in developing nations in regions such as Asia and Africa, where it causes various environmental and urban problems. The 21st century is being referred to as the age of the city. The challenge of realizing an affluent life without increasing the burden on urban environments is a common issue for all humanity. Japan is known as a country that is already facing challenges that other countries will be facing in the future, and one problem it is now facing is a decreasing birthrate and the rapid aging of its population. It is projected that in 2050, seniors over the age of 65 will comprise 40% of the population. It is an urgent task for Japan to realize cities and regional population centers that maintain their social vitality so that senior citizens can live fruitful, healthy and secure lives. In the near future, many countries, starting in Asia, are expected to experience the same challenge of an aging society. Japan's experiences in tackling this problem will provide meaningful lessons on this common challenge for humanity. 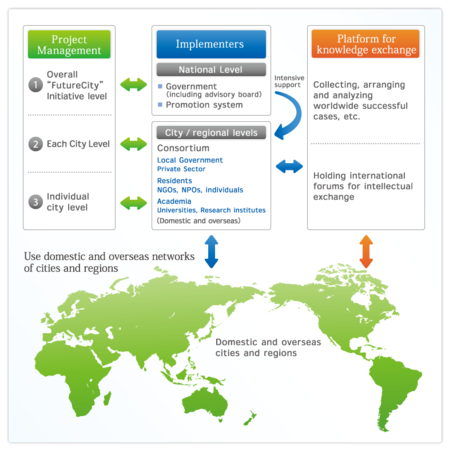 In making cities into a source of social energy, it is extremely important for stakeholders to mutually recognize the problems, organize them in a comprehensive way, and think about frameworks that can help common human challenges such as environmental problems, aging, and the need to revitalize economies and societies. In this context, the Japanese government identified the FCI as one of 21 national projects in its "New Growth Strategy" published in June 2010. The government also designated FCI as one of the national projects specified in its "Japan Revitalization Strategy" adopted in June 2013. The latter's section provisionally entitled "Realizing National Strategic Special Zone[s]," notes the government's intent to integrate related measures: "The government will steadily continue to proceed with the current special zone system and such measures including 'FutureCity' Initiatives [will] interlock with the special zones." 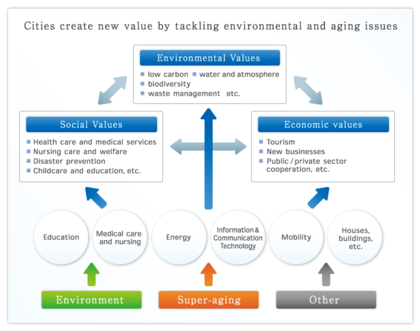 The FCI is aimed at realizing cities capable of creating people-friendly values to solve the challenges of the environment and aging, and is the world's first model case for solving common human challenges in this way. The Cabinet Office has also been promoting the Eco-Model City initiative to realize low-carbon cities. 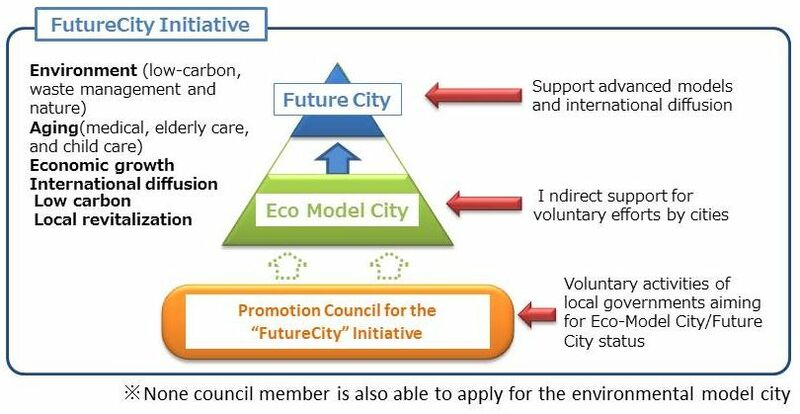 These two initiatives were re-organized in March 2013, as shown in Figure 1, so that the Eco-Model City initiative will be integrated into the FutureCity Initiative, and FutureCities will be selected from Eco-Model Cities. The FCI's basic concept is to create cities that embrace new people-friendly values in order to deal with environmental issues and the aging society. Its goal is to solve problems being faced by Japan and the world such as global warming, resource and energy constraints, and aging societies through establishing sustainable social and economic systems and recovering social solidarity. At the same time, it will be necessary to increase the quality of life and make cities into places where anyone would want to live and where everyone enjoys vitality as new sources of value continually come into being. To realize a sustainable society, it will be essential to take environmental, social and economic values into consideration. A FutureCity where anyone would want to live and everyone enjoys vitality is defined as a city where environmental, social and economic values are being innovatively enhanced. The basic premise of a FutureCity calls for the attainment of a certain level of enhanced value in each of these three aspects of life. Each FCI candidate city has to decide on its own strategic future vision for realizing the FCI's basic concepts, with the aim of maximizing an integrated total of environmental, social and economic values. When setting out the future vision, both a backcasting approach of looking back from a desirable future to the present and a forecasting approach of looking forward from the present to the future are essential to enhance feasibility. Moreover, it is important to set the vision in a way that fully embodies each city's diverse and unique features that arise from its natural and social characteristics. Each city is required to tackle the challenges of the environment and aging society, and is further encouraged to take on additional challenges in areas that can enhance their originality and comparative advantages in cooperation with other cities in Japan and abroad. It will be important to gather worldwide wisdom by absorbing information on other cites' successes from all over the world, as this will help integrate a variety of efforts in different fields and realize synergistic effects. The FCI is not merely an experiment, but a process aiming at innovation in socio-economic systems that continuously creates new value. By accumulating successes, cities are expected to break away from subsidies and acquire self-financing independence, establishing financially and socially autonomous models that are applicable both inside and outside Japan. Important factors in making the FCI a success include steady implementation of project management, powerful executive authorities that can act quickly, and strong cooperation among cities. FCI project management is needed at three levels: how to effectively promote the FCI as a whole on the national level, how to manage all projects at the individual city level, and how to grasp progress at the individual project level. Steady project management using the plan-do-check-act (PDCA) cycle at each level will increase the possibilities for success. Powerful and quickly acting executive authorities are essential to create successful cases and disseminate them both inside and outside Japan. The national government will not only give advice to FCI cities but also establish a system to promote coordinated financing, deregulation and various reforms. Each selected city is expected to form a consortium with relevant corporations, citizens, universities and local governments. Strengthening cooperation among cities can improve the success of projects and speed up dissemination. The national government will construct an international intellectual platform by collecting, arranging and analyzing worldwide successful cases, disseminating the information, and arranging opportunities for intellectual exchanges, for example by holding international forums where FCI cities can exchange information about successes with other cities both inside and outside Japan. They can utilize this platform while continuing to deepen cooperation with participating cities, including exchanges of citizens. The Eco-Model City initiative was designed to specifically and comprehensively demonstrate the image of the low-carbon society that our country aspires to be in future. In fiscal 2008, 13 cities were selected to take on the challenge of pioneering approaches with lofty goals aimed at realizing a low-carbon society. Each city has created specific Action Plans to achieve its goals and has been moving ahead accordingly while receiving advice from the Eco-Model City Evaluation and Research Review Commission. These model cities have been striving to implement their action plans in a cross-sectional manner and to take a comprehensive approach to overcome the barriers between various stakeholders. At the same time, they are cooperating with citizens and private organizations to generate vitality in their cities in pursuit of a low-carbon society, and working to become models for municipalities nationwide. Amid growing concern about energy issues due to the Great East Japan Earthquake, it has become even more essential to further disseminate information about the efforts being made by Eco-Model Cities towards developing low-carbon societies. In response, an additional selection of seven more Eco-Model Cities was made in 2012, with three more in 2013; it is hoped that this will help spur further efforts to realize a low-carbon society. 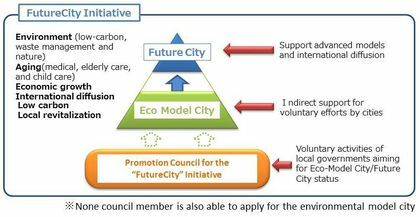 In order to refine efforts among municipalities and encourage other municipalities around the nation to take on the challenge, "FutureCities Promotion Council for the Eco-Cities/FutureCity Initiatives" was set up. 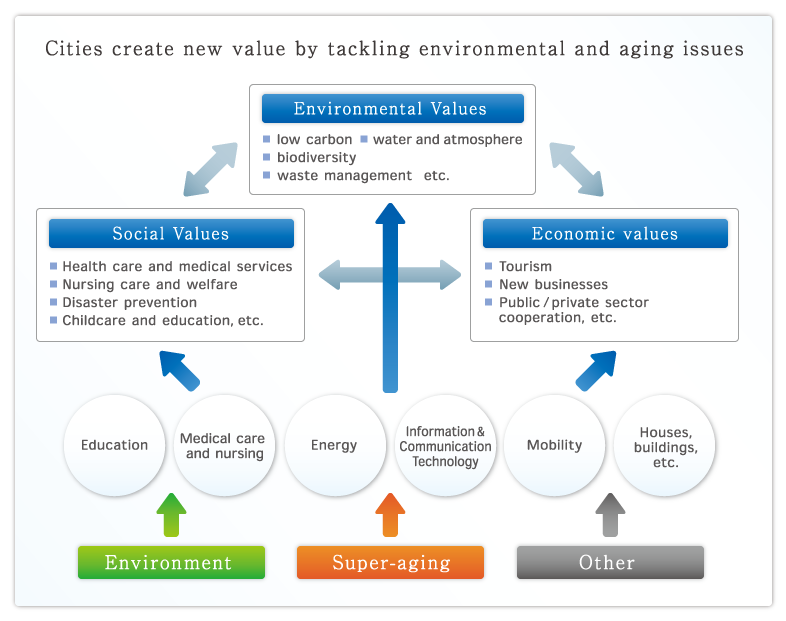 Later on, the FCI will strive to create unprecedentedly successful cases that resolve issues related to the environment and super-aging population, common issues throughout the world in the 21st century, through technology, socioeconomic systems, services, business models and city rejuvenation. The FCI also aims to share information about such cases nationwide to create both economic demand and jobs that will ultimately contribute to a more sustainable economy. Stay tuned for future progress on the FutureCity Initiative! "Autonomous urban management with pertnership among public, private and academia"
"Of cource, Shinchi is the best town"
Under the slogan DO YOU KYOTO? (are you doing good things for the environment?) let's spread eco-friendly activities from Kyoto to the world! The realization of "Cool-city Sakai", a low-carbon city with sustained "comfortable living", "bustle of the city"
Island-type low-carbon society system,"Eco-Island Miyakojima"
"Countryside type environment city, Niigata"
Achieve a low-carbon community utilized the of local resources (Forest, public transportation, renewable energy, etc. )"Mitake"
Challenge to the "Future ECO city Amagasaki "
"Eco-contribution City, Kobe", contributing to people, to nature, to the Earth, and to the future. We aim for "high-quality countryside" that shares the finite blessings nature with loved ones. 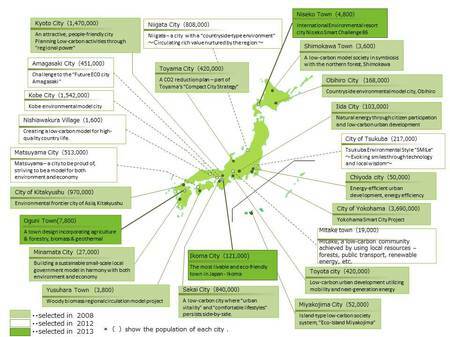 "Environmental model city to be proud, Matsuyama"